We’ve seen this before on CSBFS as well as RSBFS: The selling off of a collection instead of parting the bikes out individually. Often this is done with a rare and unique collection, or one with a theme. Reference Instant Collection or Instant Collection #2 from CSBFS contributor Brian to see previous posts on this type of activity. Today’s collection is a little different. 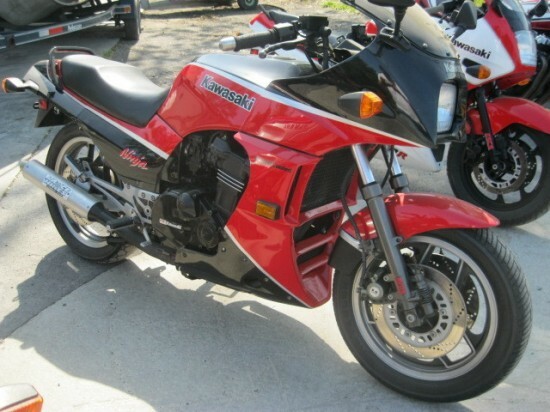 These are semi-rare Japanese sportbikes from the 1980s. The biggest draw from this collection is the fact that all the bikes appear to be in reasonable, rideable conditon. 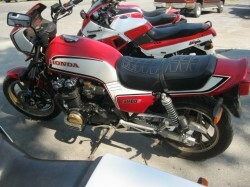 First up is this 1983 Honda CB1100F. We just shared a post on the CB1100F model here on CSBFS, and you can click here to see the previous CB1100F post. This bike looks to be in decent condition, and sports an unknown aftermarket exhaust, some engine case savers, and sundry bits of gold painted/anodized additions. The airbox has also been elimitated via the use of pod filters. See the above referenced post for values on these bikes, but note that as these are mass produced Japanese motorcycles, only clean, stock examples will bring top dollar. 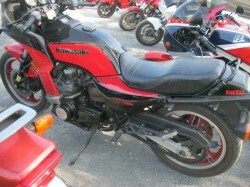 Following in chronological order is this 1984 Kawasaki GPZ Turbo. This might be the rarest bike in the collection considering the numbers produced. The Turbo also appears to be displaying an aftermarket exhaust system, but the rest of the bike appears stock. Modifications to the engine are difficult to spot in pictures, however, so the reader is always advised to ask lots of questions before proceeding. 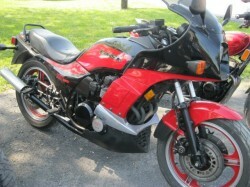 For more info on these Turbo bikes, check out this post on CSBFS or this post on RSBFS. 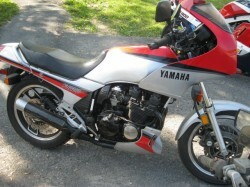 Next up: a 1984 Yamaha FJ600. Following on the heels of the FJ1100, the FJ6 was a sport motorcycle with an air cooled engine. This was the last of the air cooled Yamaha sport bikes, but still did reasonably well against the competition despite the technology gap. This bike appears to be in stock condition, right down to the exhaust. The next bike is this second year Kawasaki NINJA 900. 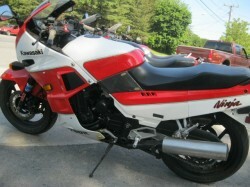 Originally thrust on an unsuspecting world in 1984, the Ninja revolutionized the sportbike community overnight. 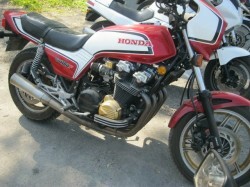 This is a 1985 model, and has a Vance-Hines pipe connected. The baddest boy in the collection? 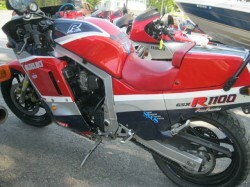 This 1986 Suzuki GSXR 1100. While not a first year model, the GSXR rocked the sportbike world by offering liter-bike performance in a package not much larger than previous generation 750s. This appears to be a well-kept model, but again is modified with a Supertrapp exhaust and filter pods in place of the stock airbox. 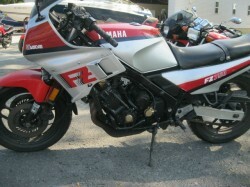 This 1985 Yamaha FZ750 was another radical bike from the mid-’80s. With the Genesis 5-valve per cylinder engine laid down at a massive angle to try to get more weight on the front tire, the FZ750 was successful both in the showroom as well as on the racetrack (Superstar Eddie Lawson piloted one in the day). 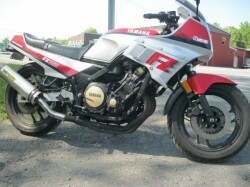 Like most of the other bikes in this collection, this FZ has an aftermarket exhaust – in this case a slip-on from Two Brothers Racing. 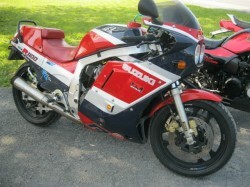 The 1986 Honda VFR 750 is a pretty sought after machine. Part of the reason for this is that Honda, after developing the VFR line for years, put this model on a hiatus. When the model was brought back into the Honda lineup, it had morphed into more of a sport tourer than sport bike. This VFR offers gear-driven cams (gotta love that sound! ), but looks a little bit used from the scant photos. Note the grime/discoloration on the engine, stand and exhaust on the left, and possible damage to the cases on the right. Even after all these years, this is one great bike. 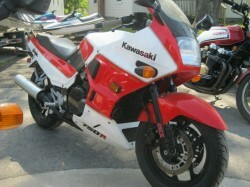 Finally, the most recent bike in the collection: a 1987 Kawasaki NINJA 750. The ’87 Ninja was, by this time, a well-sorted machine. It was also unremarkable in terms of performance, styling and collectability. That is not to damn the bike with no praise whatsoever, but it does seem to dissapear into the background when placed in a crowd such as this. The bike presents itself pretty well, although the stain on left side fairing lower is concerning. 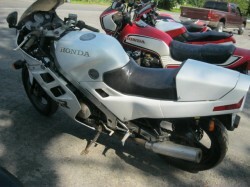 This is also the one bike in the collection that the seller noted needed mechanical work. The good news on this one is that it appears to be totally stock – making it a survivor. 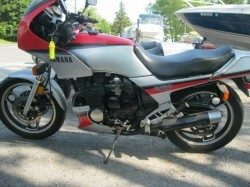 I am listing a collection of 9 motorcycles that I have been accumulating for a few years. These bikes were bought and put into climate controlled storage. They are all in good shape.. not show room condition. Most will start and run with a battery and carb cleaning. Some will need a little more. The only bike needing to be repaired by mechanic is the Ninja 750 which needs a starter gear. Most have original paint. I have many parts also available. Mileage is between 7-45k. All have clean titles. What is not clear to me is why sell off a collection in this manner? While some of the bikes are desirable, they are lost amidst the noise of the whole package. Is the goal to make more on one sale versus selling them off individually? Unfortunately, it is impossible to place a value on the individual bikes here due to the lack of pictures and information – who knows how many miles each bikes has, any modifications make, and if any of the stock OEM pieces come with the bikes? 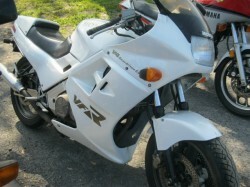 Note that there is also a YZ490 motocosser, not pictured here, included with the sale. This auction is on now, with a starting bid of $14,500 (no takers at the time of this post) and a BIN of $16k. Considering the mx bike as a freebie, the BIN represents roughly $2k per sport bike. Clearly some of the bikes listed here are worth more than that, so this might not be a bad way to get yourself some great motorcycles at a good price.